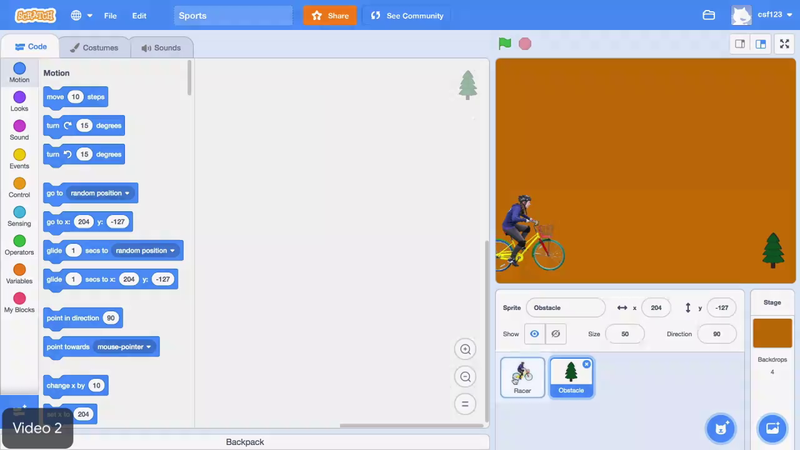 In this video you will program the racer to move up and down with the mouse pointer to avoid the obstacle. First, select the racer sprite. Click on the costumes tab and select the racer that you want to use in this activity. Then, add a go to block to the stage. In Scratch the stage is a coordinate plane. You may have learned about coordinate planes in math class. The X axis runs across the stage from left to right or horizontally. It is numbered from -240 to positive 240. The Y axis extends from the top of the stage to the bottom or vertically. It is numbered from -180 to positive 180. The numbers along the X and Y axes are called coordinates. Every spot on the stage has a pair of coordinates that represent its vertical and horizontal positions. Change the X value of the go to block to a spot on the left of the stage. Then, open the sensing menu and add a mouse Y block to the Y value of the go to block. The mouse Y block holds the current up and down position of the mouse pointer. Test out the block by clicking on it. Great, the sprite moves to the left of the stage and moves up and down according to the location of your mouse when you click on the block. However, this sprite should keep moving to the mouse's Y position forever. To do this, open the control menu and add a forever block around the go to block. Click the block stack to test it. Awesome, the sprite now follows the mouse up and down the stage. The forever loop makes the sprite move towards the mouse over and over again forever. Lastly, add a when flag click block to the top of this stack. Click the flag to see that it starts moving with this event. Program the racer to move up and down with the mouse pointer using the forever, go to and mouse Y blocks. In the next video, you will make an obstacle move across the stage. Program the racer to move up and down with the mouse pointer using the "forever," "go to," and "mouse y" blocks.